During the fabrication of high value, safety critical systems such as nuclear steam generator tubes, ovality (major diameter minus minor diameter) must be accurately measured in order to conform to demanding quality control requirements. LTC’s laser-based profiling sensors are well-suited for providing operators accurate and quantitative information regarding the condition of tubes that must be manufactured to high tolerances. 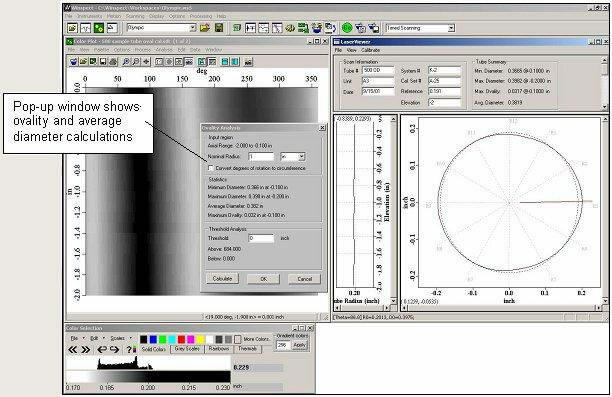 Our control and analysis software includes an Ovality Analysis function that operators can use to accurately calculate the ovality, maximum diameter, minimum diameter and other aspects of tubes that have been scanned using our laser-based profiling systems. Other available analysis tools include the generation of descriptive statistics over user-defined areas and several filter options. Operators may also export data for additional processing and analysis using commercial scientific software packages.